In my opinion, Point Reyes National Seashore in Northern California easily wins as the most likely coastline on Earth to inspire poetry. But landlubbers get only a small peek at the goods. The real magic of this 80-mile stretch is on the waters of Tomales Bay, where sea lions nudge your hull, and bioluminescent microbes can transform the waters into an Avatar-like wonder. Whatever shore in the West you choose, though, kayak camping is in certain ways easier than hauling a pack along a trail while still giving you access to otherwise inaccessible beaches. By day, you can paddle beneath water birds and above marine life. By night, you can sleep on a deserted stretch of sand that beats any rocky patch of dirt. And it doesn’t matter whether you’re a first-timer or a seasoned pro. 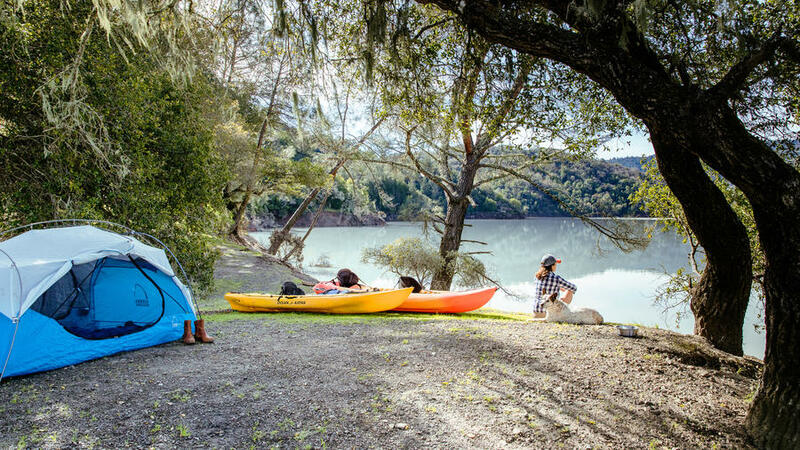 “Kayak camping is safe even for beginners,” says Dallas Smith, operations manager and guide at Blue Waters Kayaking in Point Reyes. Here’s your plan for getting out there. in advance. If there are no permits left, check for guided group kayak camping trips, which may still have availability. Most popular kayak camping areas have a rental outfitter nearby. Reserve ahead, and expect to pay $100 to $150 a night for single and double kayaks, respectively. Most kayaks don’t include a lot of storage. Pack accordingly: Essentials include a puffer vest with waterproof shell, hat, quick-dry clothing, headlamp, lightweight tent, sleeping bag, backpacking stove, food (pack in dry bags), and water. If there’s no potable H2O at your site, you’ll have to haul all of your own (1 gallon per person, per day). Finding it hard to pack light? Some kayak outfitters will motor out extra gear for you. GEAR: , from $18. Check your local outfitter’s website for a map of launch sites and beaches so that you can plan your route. If you’re going on water with a current or waves, the rental shop will prep you on how to handle them before they’ll let you go out on your own. Wind speeds pick up after noon, making paddling infinitely harder, so plan on an early launch. Break up a 5- to 6-mile paddle to your campsite into two sections, with a hike or beach picnic in between (if you’re taking in the scenery as you paddle, you’ll probably average about 2 miles per hour). If you’re going out on the ocean, check tidal charts for the area before you go. After you’ve set up camp and the sky turns dark, you’ll notice that the water gets silky smooth. So before bedtime, it’s well worth getting back in the boat. In areas like San Diego’s Torrey Pines State Beach and Washington State’s San Juan Islands, you’ll also get your own light show, with scores of bioluminescent algae doing a disco in the water. Always bring a headlamp for safety. Нашел в интернете авторитетный интернет-сайт на тематику www.apach.com.ua.